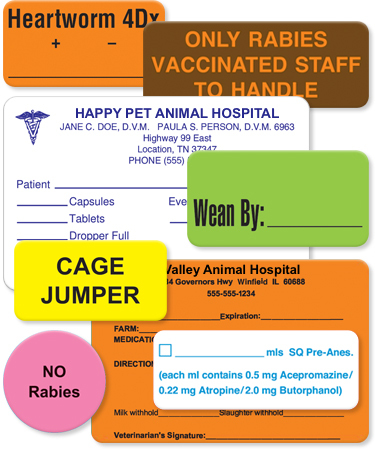 United Ad Label stocks hundreds of labels for applications throughout a veterinary clinic. But, what happens when you need a label, one that’s not in catalog? You could waste time and money trying to figure out what you need with someone that doesn’t understand your business. Or instead, you can use the UAL Custom Label Builder (CLB) to personalize a label to fit your veterinary clinic needs. The CLB uses a WYSIWYG interface to simplify the custom label ordering process. No label expertise required! The system steps you through each stage of building a custom label. It automatically prompts you to select from only the information that’s applicable to each stage. In addition, it’s cost effective. The template based model keeps costs in check. Today’s business needs have changed. Solutions for technology, communication, education and services have evolved. But one thing hasn’t changed. UAL stock and custom labels perform important functions for Veterinary Practices. Whether you want to create a custom label to enhance care, better organize your operation, or use to personalize your veterinary clinic, UAL has a solution. Try the Custom Label Builder and get the labels that your veterinary clinic needs today!